Brisbane and Perth had got their smartcard systems before the Myki system started in Melbourne (just on 5 years ago). Other cities have followed, and now all Australian capital cities have public transport smartcards. Every single one of those other cities has a paper or single use ticket alongside the smartcards. And every single one of these other systems has been provided by a supplier with a track record of installing smartcards on other public transport systems — in fact many of them tendered for the Myki project — but our government ended up with a system to be built from the ground up. My view is this was the biggest factor in the delays to implementation, all the technical problems along the way, and the end result of a system that to this day is still lacklustre. However I don’t think it was necessarily the biggest factor in the total cost of the system — believe me, software developers don’t get paid that much. No, I suspect the costs are largely down to the size of the rollout. Sydney’s Opal system is based on pre-existing Cubic technology, and is in the same ballpark for cost… however as we shall see, Brisbane appears to have got away with a bargain. Got any corrections for me? Please, send me an email or leave a comment below! Most of the systems cover more than just the main metropolitan area. Myki covers regional rail out to Geelong, Ballarat, Bendigo, Seymour and Gippsland, and the local bus routes in those areas. Sydney’s Opal similarly covers the entire area of the Sydney urban and intercity rail network, which includes Newcastle (the area, but not the central station, which has now closed), Bathurst and other regional centres. Perth’s Smartrider covers local buses in places like Bunbury and Geraldton, but not the regional services that will get you there. Prize for the most prolonged rollout goes to Myki: early 2009 for regional town buses, but not active on V/Line until mid-2013, and in that time, the scope was reduced to remove short term tickets, purchase/top-up on trams, and long distance V/Line trains and coaches. I had a lot of trouble finding comparable figures for system cost. Some only include the initial rollout, but not running costs. Some such as Brisbane had a provision for the system supplier sharing “secondary revenues” if/when the system was able to be used for other purchases, though this document says the cost was $99 million to establish, and $53 million in running costs to 2016. I think the biggest factor in the system cost is the size of it — the number of devices — thus I’ve tried to compare them via the places you can buy and top-up/recharge cards, and the fleet and system sizes. The number of railway stations and the size of the tram and bus fleets is also significantly different. Note that in Adelaide, the readers are on the trains, not the stations (except for Adelaide station). Perth’s rail network has 70 stations, but only 19 have top up machines. In Brisbane (Gold Coast), the trams have their readers on the stations, not on the vehicles. Of course, Myki has to have more devices: touch-on and off is so slow that extra readers have had to be installed at railway stations to minimise queuing and crowds (some have been added as recently as last month), and the lack of a short term ticket or any way of buying a ticket on a tram means a wider retail network is important. Sydney’s system still appears to be in flux, so it wouldn’t surprise me if card purchase and top-up becomes more widely available in future. 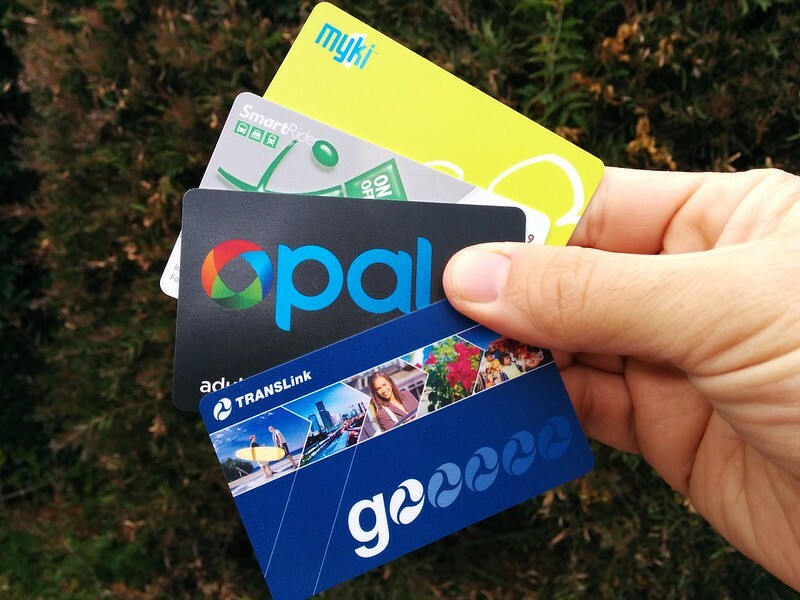 The cost to a passenger of just getting a card varies widely, with Brisbane and Perth cards costing $10 a pop. In most cities, the smartcards are very much geared at regular users, who don’t mind having more money on their card than a departing tourist would. Perth and Sydney in particular are quite restrictive in their topup amounts. As has been noted before, Melbourne is one of the only big cities anywhere in the world which doesn’t have some kind of paper/single use ticket available for use — certainly the only capital in Australia. I’ve also compared the base level fare for a peak-hour adult inner-suburban trip. I’ve excluded very short trip fares to try and make it reasonable comparable, but it’s very difficult to do this properly without digging around and ensuring you’re comparing trips of a similar distance. Of course, fare prices are not a direct product of the Smartcard system, but the fare policies in place. But the two are closely linked. Daily caps help people who use public transport for lots of their travel, not just to and from work. Thus they help encourage non-commute trips, and are good for tourists. Some of the systems have no daily cap, but note most of those that do apply a simple dollar amount — apart from Myki, which is more complicated, though to an extent this will be wasted from 2015 when Melbourne trips are capped at the zone 1 amount. Brisbane’s Go Card has a 2 journey daily cap only for Seniors, which indicates it could be implemented for more users if they wanted to. Most systems will also string together multiple trips into a single paid journey if you travel continually, so you don’t end up paying for lots and lots of fares in a single day — though in Sydney you may, if you keep changing modes. As noted yesterday, Myki was originally intended to have a weekly cap. The other systems largely don’t, though Sydney and Brisbane have a X journeys then free policy, which can be rorted by taking short lunchtime trips early in the week to reach your quota by about Wednesday. It’s reflective of the simplistic capping in those systems, and arguably starves the system of revenue from long distance commuters who would use the system anyway if the cap was less generous. A more intelligent weekly cap would be better. Only Myki and Adelaide’s MetroCard offer a pre-loaded Pass system. In Myki’s case, this reflecting the old Metcard structure, which in turn goes back to the paper tickets of the 80s and earlier. This is a double-edged sword: many people find the difference between Myki Money and Pass confusing, but fare policy-wise there’s probably no better way to encourage people to use public transport more. Adelaide offers a 28 day pass only, but interestingly offers a system called Commuter Club, which is similar to Melbourne’s Commuter Club, offering discounted fares if issued via employers/organisations. Sydney’s system falls down on free transfers: if you want to change modes, you get stung for another fare (as well as the time penalty of the transfer). There are rumours this will change in the future, but who knows. Many people have complained about Myki’s slow online top-up speed of up to 24 hours, but in fact Myki faster than most of the other systems. Only Sydney, with a time of up to 60 minutes, seems to have got this right. They’ve probably made use of mobile data technology to get the top-ups from the central servers to the devices on buses and ferries and trams. All the systems except Darwin’s (which isn’t really a Smartcard) offer an automatic top-up system, automatically adding value to your card when it reaches a pre-determined level, then taking those funds from your linked bank account. Myki’s auto top-up started off flawed (it would block your card if the payment didn’t work, forcing you to send the card in for unblocking — this has now been fixed) but in my experience works fine now, and is very handy — I never have to worry about topping-up my kids’ cards. Some of the other cities encourage auto top-up by providing you bigger fare discounts. My non-scientific evaluation of the speeds of some of the systems. Myki is hopelessly inconsistent, except for the new gates recently installed at a handful of locations. 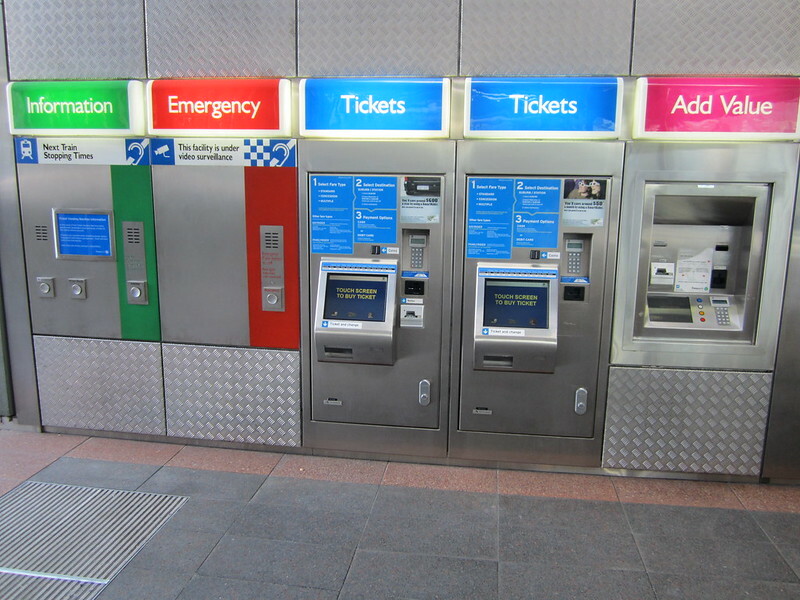 From limited use of the other systems, they all seem much more responsive, though in Brisbane the card read was fast, while the gates seemed to open up quite slowly, which could be problematic at peak times. Sydney — still in flux. Limited card purchase opportunities at the moment, but seems to be changing. Hopefully intermodal transfers will become free in the future. Perth — Very limited card purchase or on-system top-up opportunities, which helps explain the cheap cost of implementation. Tasmania — Card is set to a “Default” trip (eg home to work and vice-versa). Anything else requires resetting by bus driver. Arguably it’s more of an electronic purse system than a Smartcard. Ditto Darwin. Why is there no combined system? The tollways of Australia have got their act together: an eTag used on Melbourne’s tollways can be used in Sydney and Brisbane, for example, and vice versa. Why not public transport smartcards? In Australia, while Perth, Sydney, Brisbane and Melbourne have each selected the same card interface, there is no immediate prospect of achieving smartcard data, reader or back-end interissuer interoperability. Efforts by the National Ticketing and Tolling Working Group (NTTWG) and Standards Australia are effectively on hold while each city rolls out its own vendor-specific implementation. It’s like the 21st century version of the break of gauge. Would Victoria embark on Myki again now, knowing the outcomes in terms of costs, delays, reliability and speed? I doubt it. At one stage they tried to claim we had to have a system built from the ground up, because none of the others could cater to the state’s requirements in terms of our public transport system being large and including multiple modes. I always found that very difficult to believe — plenty of other systems handle big multi-modal systems with ease. I suspect there is some truth in that pre-existing systems may not have handled our structure of unlimited use Passes so well, though Adelaide seem to have managed. So which system is best? I’m not sure there’s an easy answer. Ideally you’d want the ubiquity of Myki, the single ticket alternative and speed of (any of the others), and the cheap system establishment costs of Brisbane or Perth. In fact Brisbane is probably the closest thing to being a extensive big multimodal smartcard system that was relatively cheap to implement. Even if it were doubled in size and cost, it would still come out at about a fifth of the Melbourne system cost, though it’s unclear if that reflects the real cost or if it was just a great deal for the government, and Cubic was betting on that extra revenue to come through. Taking on an existing system also requires any city to change its fare structure somewhat to suit the ticket system — but Melbourne ended up making compromises in that department anyway. A few notes about Canberra / MyWay:  same vendor as Perth – both are Downer EDI / Parkeon (MyWay was an adaptation of Smartrider system)  Fares will increase on 3/1/15  MyWay instead of a weekly cap, has a monthly cap of 40 “paid” journeys, or 30 for School Students (resulting in a theoretical monthly maximum fare of $113.60 under the old fares)  Online top-up speed will vary, but minimum 2 working days and 3 for BPay. (Also, I believe Perth’s system has 1 day credit card top ups)  MyWay card read speed: Medium, maybe – just a bit slower than Perth or Brisbane and marginally faster than Myki – as long as passenger holds card in the right position. Don’t agree about Perth having limited card purchase or on-system top-up opportunities – especially not compared to Canberra. Perth may not have the vending machines like Adelaide and Melbourne, but it has on-bus top ups, station AVMs and many retail outlets. MyWay by comparison is abysmal: very few retail outlets, no AVMs or on-bus top-ups and customer service via phone or Canberra Connect (which doesn’t have an outlet inside the CBD). @ACTBusspotter, thanks, will make corrections. Yes, Perth has station AVMs, but only at a fraction of stations, 19 out of 70. * GoCard also serves the Sunshine Coast. Looks like there are more than 800 myki top up locations including both retail and station/stops. 1113 to be exact, if my Ctrl-F search is right. 1. The Smartrider cards can be used to pay for parking at train stations. Do the other cities have this feature? 2. The top-up machines only accept DEBIT cards. What is the position in other cities? Why don’t they offer credit card top-ups? Presumably fees are higher but if very few people can use the system what’s the point? I have no idea what proportion of people have debit cards but I suspect it’s not very large. I’ve had a credit card since 1980 but I only got a debit card last year when the 28 Degrees credit card starting charging a fee to make overseas ATM withdrawals (they still have no foreign currency transaction or conversion fees) so I got a Citibank debit card that has none of these fees. I also got a Ubank debit card because if you wanted the 1% bonus interest it came as part of the package. @Andrew, as far as I know, nowhere else in Australia charges for parking, let alone uses smartcards for payment. Most of the other machines, I seem to recall, will accept credit cards. Certainly Myki machines do. On the question of interoperability with smart cards, the best example of this is in Japan where most smart cards work seamlessly with other systems. This is really handy as you can for example you SUICA card (Issued by JR East – Tokyo Region) on the Fukuoka Subway and not have spend time figuring out what ticket to buy. The cards are also accepted for payment at vending machines and stores as well (“IC Card” is the common trademark of the interoperable cards). Fares in Japan are mainly charged per trip, although you can add commuter passes to these cards in various cities. Nice comparison, some comments/corrections regarding Opal. Opal is of course, is Sydney’s second attempt at a smart card, so we could take the prize by dating the roll out back to back to 2005 when Tcard trials began on school buses. Under Opal the difference between a trial and roll-out has pretty much been one in name only. In the spirit perhaps of George Bush’s “Mission Accomplished” declaration, 9 days after the “Job done – Opal roll out complete” press release, it was announced that top up machines will “be rolled out from early 2015”. Card cost: The receipts issued with Opal cards, show that system has been designed to be able to charge a card fee and deposit. Minimum top up: Varies by card type. Half the amount for concession and child card. $2.50 for the pensioner/senior card – the same as their daily cap. Single use alternative: At the moment, on prepaid bus services, ferries and trains the single use and many multi use alternatives only exist because the old AFC system continues to be maintained. While children holders still have access to off-peak rail returns, others need an Opal card to access off-peak rail fares. Peak discount compared to single use ticket: The table obscures the fact that there are discounts under Opal compared to single use tickets at all times ranging from 19% on the Newcastle Stockton Ferry, 15% on Train 1 fares to as little as 5.5% with the Ferry 2 fare. In contrast, the (now discontinued) FerryTen and the still available BusTen offer a 20% discount on a single fare. The Bus Ten is still cheaper than Opal, for someone taking less than 9 (down from 10 in 2014, since no 2015 price rises for Opal bus fares) bus trips a week and not transferring between services and not advantaged by the $2.50 Sunday cap. Children (formerly Adults also) can benefit by purchasing an off-peak ticket and legitimately traveling in the afternoon peak. Smartcard fare: inner suburbs to CBD peak: It depends on the mode of course. For buses, the 3-8km fare in 2014/2015 in $3.50, for Sydney Ferries the current 0-9km fare is $5.74, compared to the 2015 0-10km fare for trains of $3.38. Weekly cap: $30 for children/student concession holders, Seniors/Pensioners are not entitled to a lower monetary cap, their maximum is 7 x daily caps, i.e. $17.50. The monetary cap is particularly important in Sydney’s system for multi-modal travellers, as it is possible for a single journey to exceed the daily cap so they would never hit the 8 journey cap without gaming the system. : The Opal adult, child and concession daily cap can be hit with 2 65km+ train journeys. Seniors/pensioners will also hit the daily cap if their first journey of the day includes a Sydney Ferries trip. Yeah right, but you may as well make omlettes when you have broken eggs. Another problem which was not the case with weeklies is that the cap runs Monday to Sunday. Those who previously bought occasional weeklies mid-week are disadvantaged with this method. I agree a more intelligent cap would be preferable and also the “reward” should be proportional to the spend. otherwise we run the risk of shorter distance fares rising to cover the shortfall. An alternative of course is to have passes instead of badly designed caps. For many if not most multi-modal usage scenarios the MyMulti weeklies remains a cheaper alternative to Opal. Cap stupidity seems to be a feature of Cubic systems. If social media is to be believed, passes are an extra cost option with Cubic systems. There also was arguably a need for the unlimited bus travel in all zones regardless of MyMulti type/extent introduced with the Myzone reforms — which we’ve now replaced with unlimited travel throughout the entire system on all modes once the cap is reached. How exactly were weekly caps meant to work on Myki for those with a mix of Zone 1 and Zone 2 daily caps? Free transfers: You almost need a course to understand the cases where free transfers are and aren’t available and the limitations that apply, so I’ll pass on giving the few documented and many undocumented details that have been reverse-engineered for now. Free transfers between different modes *are* currently available in Newcastle by virtue of effectively classifying some services as if they were other modes. The Stockton Ferry is classified as a bus, the interim rail replacement bus services are classified as rail. The South Eastern light rail is slated to be classified as a bus. It’s social media speculation and predictions from transport planners that the mounting exceptions from new transport projects must force change to a more sensible system. Do you want to put your money on logic or continuing stupidity? While providing free transfers between services on the same mode would seem to be a good idea, it causes undesireable “mode stickiness” when people need to change services anyway. So rather than transferring to a train for the benefits of themselves and the system many people will just choose to catch another bus. Really a poor idea as far as transport planning is concerned. YMMV, Mobile communications to buses can be problematic. It has to be a credit or scheme debit card, Opal won’t take funds directly from a bank account. Failed auto topups, reverse the credit and disable future auto top ups. Which system is best: Never mind reader speed, all I really want from my smart cards is multi-modal fare integration and intelligent daily caps (and possibly passes). I really envy the intelligent daily capping under Myki, but the fare system would be better with a short trip fare as well. Singapore distance fares seem a reasonable alternative to having zones but they have some stupid restrictions. I envy Myki tram users not having to tap off in Zone 1, unfortunately, Opal hits you with, in most cases, a double penalty for that. Apart from comparing default fares you might compare the minimum fare balance rules, unfortunately, the web site lack sufficient details but apparently provided you have the minimum fare balance for the mode of your first trip you can transfer and complete the journey even if your balance goes negative. Please substitute “minimum balance” for minimum fare in the last line of my post above. It occurs to me that one criteria that should definitely be included on the table is whether refunds are available and the ease or avenues of obtaining them. That’s a particularly important one for visitors without friends or family here. For Opal, refunds can only be made Australian bank accounts or by cheque if the amount is > $5.00. Applications can only be made by paper mail on the official form enclosing the card. It is not clear to me whether any fees currently apply. It’s a particularly huge disincentive for international tourists. For anyone that cares about such things its interesting to consider whether the fare rules generate behaviour from customers that is of benefit to the system or the wider economy or whether the system burdens the informed consumer with complexity and makes the indulge in irrational behaviour. Compared to Myki, the Opal rules require consumers who wish to lower costs take unnecessary additional trips, delay transfers, stick to one mode or take cheaper journeys before more expensive ones. Exact bus fare calculation now requires computer assistance or at least a scale map and a ruler. Over Opal, the only complexity I can see in Myki is whether a pass should be purchased or not. Most previous purchasers of periodicals would certainly be happy to to be “burdened” with the option of passes and the not insignificant financial rewards for them as would many multi-modal users who can’t be bothered with gaming Opal once that is the only prepayment option. I would like to dispute the claim that Melbourne is the only large city without paper tickets. I’m currently in Jakarta, Indonesia, with a population of the entire region at about 24 million (probably 10 million in the central area). Their Rapid bus network (Transjakarta) and the Commuter Railway have just abolished single use fares, forcing people to purchase a prepaid card that will allow them to travel on trains and buses, costing 20.000rp (approx $2 AUD). On the up side, you can choose from 5 different cards or so to which one you use! The bad news? Readers are significantly slower than Melbourne! I also tend to buy the paper daily ticket on Brisbane/Logan buses (555 for example) as GoCard isn’t capped so it is better value to NOT use GoCard on multiple trips in a day. This is a great write-up. Thank you for taking the trouble.